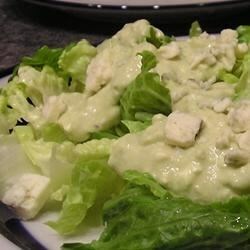 "Avocado, blue and cottage cheeses, Worcestershire sauce, and lemon juice are all blended together for a deliciously fresh and creamy salad dressing." In a blender or food processor, place the avocado, sour cream, blue cheese, cottage cheese, lemon juice, Worcestershire sauce, onion salt, garlic powder, salt, and pepper. Blend until smooth. Cover, and refrigerate 30 minutes, until chilled. Loaded with super foods, there’s a ton of good stuff in this healthy salad. this was very good over all, i am not a fan of blue cheese so next time i will not be adding as much of it.